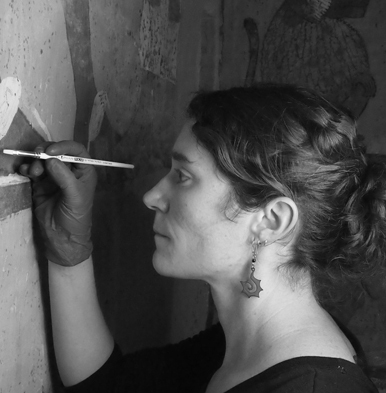 Jennifer Porter is a wall painting conservator with extensive experience in conservation science, research and education. She has worked with institutions such as the Courtauld Institute of Art, Instituto Nacional de Antropología e Historia of Mexico and the Getty Conservation Institute on field conservation and research projects in the Americas, the Middle East, Europe and Asia, including highly important sites such as the Tomb of Tutankhamen in Luxor, Egypt. Porter is currently Assistant Lecturer in the Department of Conservation and Built Heritage at the University of Malta, where she coordinates and lectures on the MSc course in the Conservation of Decorative Architectural Surfaces and directs student field projects. She holds a MA in the Conservation of Wall Paintings from the Courtauld Institute of Art. Porter & N. Cutajar. 2017. ‘Rediscovering 19th-20th Century Domestic Architectural Painting in Malta’. Poster presented at the 6th International Architectural Paint Research Conference, University of Columbia, New York City, New York, March 15-17 2017. Wong, B. Bicer-Simsir, J. Porter, S. Rickerby, A. El-Din M. Sharkawi. 2016. ‘Analytical challenges in the study of New Kingdom plasters from tombs in the Valley of the Queens, Luxor, Egypt’. In: Proceedings of the 4th Historic Mortars Conference (HMC 2016), 10-12.10.2016 Santorini, Greece, pp. 67-76. Mazurek, J. & J. Porter. 2015. ‘Use of ELISA in identifying proteins in the Tintori wall painting replicas’. In: Organic Materials in Wall Paintings: Project Report, F. Pique and G. Verri, Eds., Getty Conservation Institute, Los Angeles, pg. 122-131. Porter, J. Herrick & K. Corda. 2013. ‘Account of an informed bat exclusion at the temple of Deir el-Shelwit, Luxor, Egypt’. Conservation and Management of Archaeological Sites, Vol. 15, No. 2, pg. 195-212. Grimaldi, D. M., L. Pérez & J. Porter. 2012. ‘The preservation of sandstone reliefs at the archaeological site of Tajín, Mexico using colloidal silica’. Poster presented at the 12th Annual Congress for the Deterioration of Stone, University of Columbia, New York City, New York, 22-26 October 2012. Parodi, L., J. H. Porter, F. Preusser & Y. Pozeilov. 2010. ‘Tracing the history of a Mughal album page in the Los Angeles County Museum of Art’, http://asianart.com/articles/mughal/index.html . Online publication for http://www.asianart.com/. Porter, J. H. & J. Mazurek. 2009. ‘The effect of environmental deterioration on the ELISA analysis of organic media used in wall paintings’. Paper presented to the Research and Technical Studies Subgroup of the American Institute for Conservation, 37th Annual Meeting, Los Angeles, CA, May 19-22 2009.